Spring and summer are no rest for a weary campus. 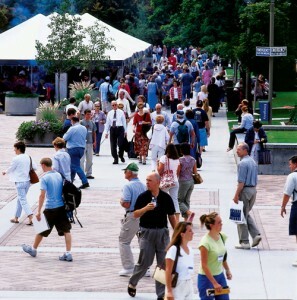 For two consecutive summers as a teen I joined unabashedly enthusiastic throngs of cheer-chanting LDS youth converging on BYU campus for a week of social and spiritual revival—better known as Especially for Youth (EFY). Crowding campus sidewalks and buildings with nearly 1,000 of my peers, I made dozens of friends, “got down” at multiple jam-packed dances, enjoyed a measure of spiritual enlightenment, and generally whooped it up during the week of rah-rah-rowdy fun. To 15-year-old me, coming to BYU for EFY seemed to be the pinnacle of cool for a Latter-day Saint youth—and pretty high up there spiritually. Before my mission I even worked at Ricks College for two weeks as an EFY counselor. By then, though, I remember feeling vaguely apologetic for intruding on that campus’ seriousness with our exuberance. And more than a decade later, I’ve definitely moved out of that let’s-make-up-a-cheer-and-march-around-campus-yelling-it phase of life. These days, I sometimes forget my former zeal for programs like EFY and once in a while catch myself grumbling about BYU’s open-armed generosity that keeps campus crawling with activity each spring and summer—just when I feel ready for a yearly breather and a little more elbow room. But the school with the world as its campus, it seems, is determined to open its campus to the world, making facilities and educators available to scores of groups with interests ranging from folk dance to football to family history. Just as the hefty student crowd thins from more than 32,000 to a trim 11,000, the campus swells with activity again. It starts with Women’s Conference’s 15,000–20,000 in May; add to that EFY’s 17,000, sports and dance camps’ more than 11,000, and adult conferences’ roughly 4,000, and the pace seems hardly to have slowed at all. Top off the summer with Education Week’s 22,000 participants who arrive on campus in August, and there are easily more learners during spring and summer than during either semester on this campus that never quits. There are easily more learners during spring and summer than during either semesters on this campus that never quits. One mid-summer’s day this year when I was feeling a little grumpy about sharing my habitat with the masses, I happened to be walking through the Smith Fieldhouse. Standing on the main basketball court, in front of a couple of hundred drooling 12-to-16-year-old boys, stood Mark Madsen, the Minnesota Timberwolf I’d seen just a few days before in the NBA Western Conference Championship series. Transfixed, I found a seat high up in the stands and watched him demonstrate the finer points of jump hooks and throw down a few dunks, as boys from the audience oohed and aahed and dreamed about their own futures. Though dreams of sports fame no longer simmer in my consciousness, the moment stirred my brew of memories and brought the magic of that hopeful age again to the surface. For a moment, it was easy to remember why such things made my heart pound 15 years ago. Experiences like this remind me that BYU serves a lot of communities—some with interests and needs that differ from mine but that are just as valid and worthwhile. It’s like something my 5-year-old daughter, who finished her second semester at BYU’s preschool in April, reminds me of when she declares that she “went to BYU,” just like her parents. She’s got a point. Sure, she was never admitted to the full feast of BYU’s offerings, but she did gobble up the 4-year-old-sized slices of learning and growth that the BYU preschool dished out four days a week for two semesters. And though she didn’t partake of high-level courses in English, sociology, or economics, she did whet her appetite for children’s literature, learn a fair bit about social dynamics, and study the art of sharing—valuable lessons for a 4-year-old. She was a student at BYU, just not a BYU student. Learning to share can be an equally valuable lesson for a 30-year-old, I’m finding, and it’s one the summertime crowds are teaching me, even if I resist a bit. What I lose in elbow room, I gain in respect for BYU’s willingness to let down the drawbridge, allowing learners of various ages and aspirations to explore the corners of its educational realm that interest them. By opening its borders, BYU makes temporary citizens of tens of thousands of visitors each year—not official BYU students, but students at BYU nonetheless.